The following is the second installment in our series about document storage options in Parallels Desktop 10. To start from the beginning, click here. Last week’s post covered how to store files in the Documents folder on your Mac. With this storage option, you deliberately don’t mix up your documents. Documents created by Mac applications are stored on the Mac, and documents created by Windows applications are stored in Windows in your virtual machine. You are keeping the two environments separate, and if you need to use a document in a different environment from the one in which it was created, you’ll need to move it to the other environment by dragging and dropping. This choice works best if you run Windows in a window on your Mac (or in full-screen), and you don’t use Coherence. To optimize this storage choice, you’ll probably want to turn off sharing between Mac and Windows—this will prevent documents from showing up in two places at once. 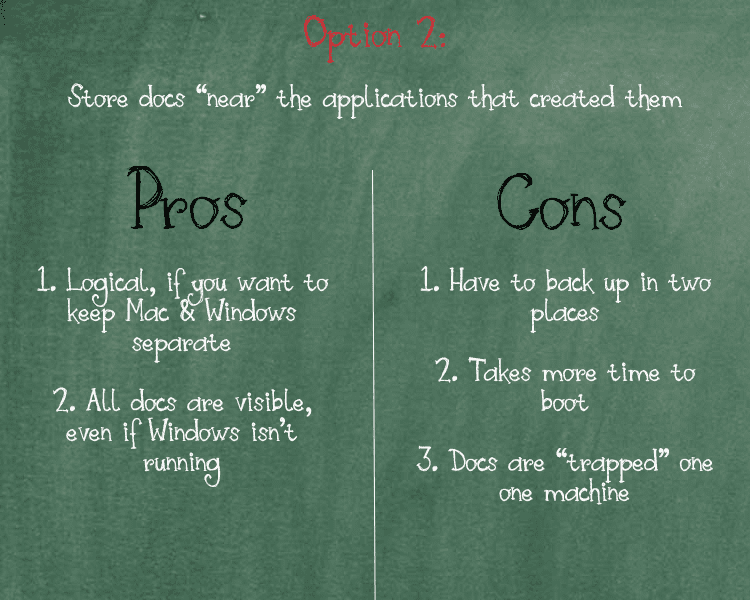 Logical, if you want to keep Mac and Windows separated. You have to back up your documents in two places. If Windows isn’t already running, opening a doc generated by a Windows application may take longer because Windows has to boot up. Docs are “trapped” inside a single virtual machine. You’ll need to turn off the default sharing options in Parallels Desktop. So, where do you store your docs? Stay tuned for Part 3!